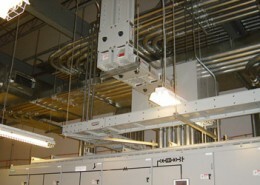 Hatzel & Buehler completed the electrical contract for a new data center for a major financial company. 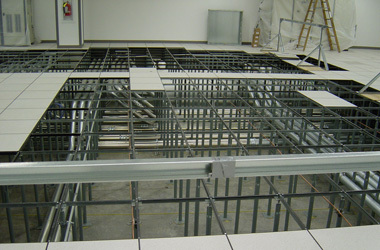 Scope of work included the addition and renovation of 25,000 square feet of office and support space, 25,000 square feet of raised floors to be supported from an existing MEP space, and renovations to add chillers, pumps and cooling towers to keep the new data center at a constant ambient temperature. 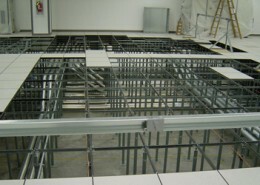 These new spaces required the expansion of the existing fire alarm and security systems. 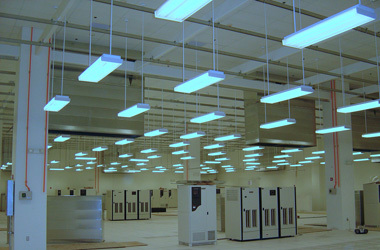 This mission critical facility provides redundancy feeds for the IT equipment at the branch circuit panel board level through redundant circuits to the equipment, and at the PDU level through controllable static switching. 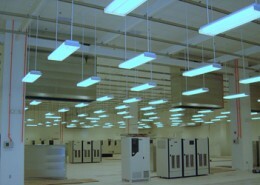 The existing data center, which consisted of a single UPS system, was renovated by adding two additional UPS systems. The new UPS modules supported thirty-two new Power Distribution Units for IT equipment thru static switches that were fed from a preferred and alternate source originating from twelve new PDU distribution panels. The twelve new PDU distribution panels were equally divided and fed from the two added UPS systems. The nineteen added panelboards in this project supported the newly renovated offices but also supported the IT fit-out of a section of the new data center. As the project progressed, Hatzel & Buehler was able to fit-out most of the new data center as it was being developed by adding remote power panels from the new PDU’s that provided the necessary branch circuit power for the IT equipment in the new space. Due to our successful completion of this project, we have also been involved in the addition of a fourth UPS system to this facility and its required cooling equipment expansion.